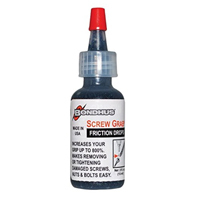 A single dab of SCREW GRAB creates a positive grip between metal surfaces (tests have shown as high as 800%) that virtually eliminates tool wear or rounding and deforming of fasteners. Works on: Rounded or deformed heads; seized, rusted or hard to reach spots; sloppy or mis matched sockets; stops bits from turning in a chuck; prevent tool wear. Works instantly. Easy to use, wipes clean. Satisfaction guaranteed.